It's always good to see the work you have been doing. 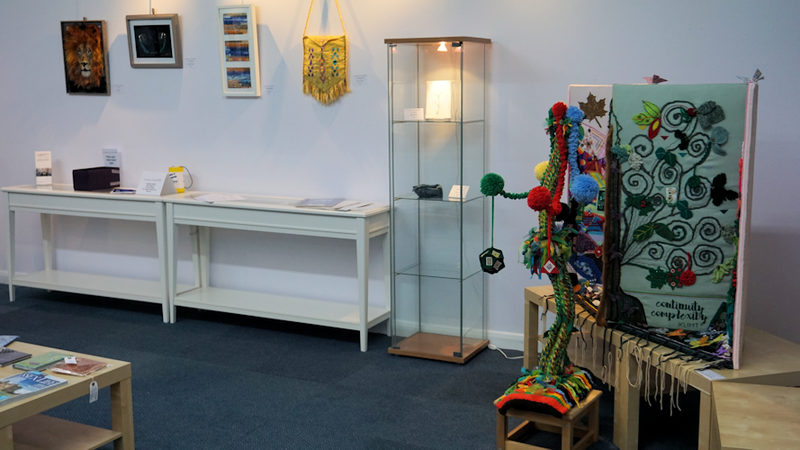 This is reflected in our Workshop exhibition each year and also Tantalising Textiles which is now in the Alchemy Gallery (see below for more details). 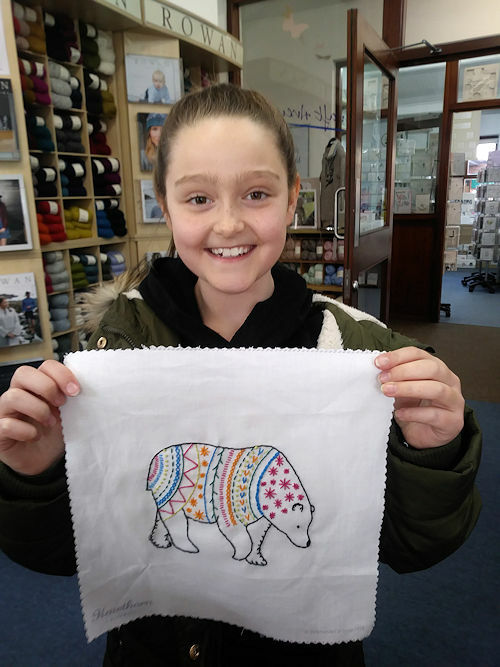 We were especially pleased to receive a visit from Holly and her Nan this week who came in to show us the Hawthorn Handmade bear that Holly had completed. Doesn't she look delighted? And so she should be - Holly is 8 and stitched it all herself! Whilst they were here they bought another kit, so I look forward to seeing that too. 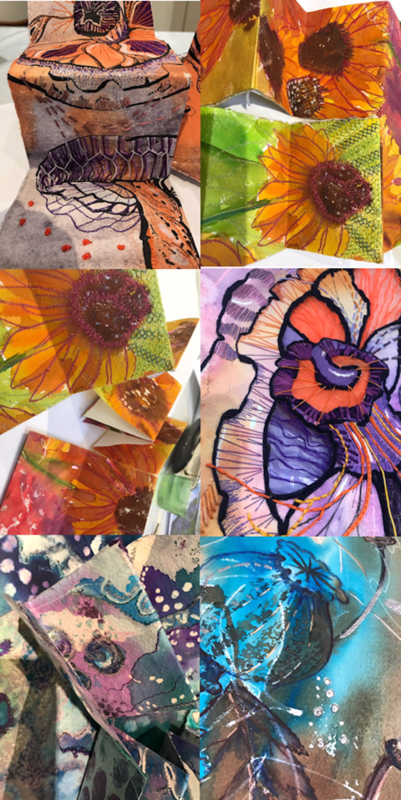 If you have any pictures of work you have made with products purchased at Craft Arena, we would love to see them - or pop in with them and we will take a picture and feature it in the newsletster. I'm asking for a bit of help this week. 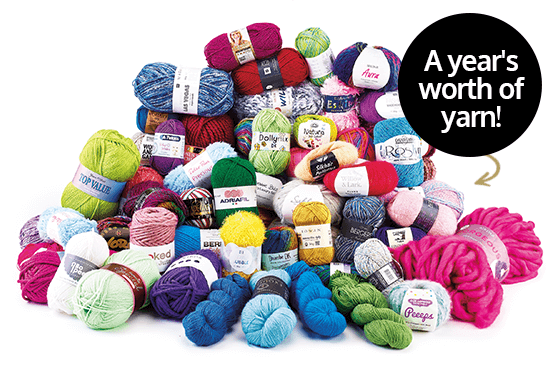 Nominations are open for the British Knitting & Crochet Awards, and if you take the time to nominate Craft Arena, there is something in it for you - a chance to win a year’s supply of yarn! You can nominate us in the Best Local Independent Store, South East of England category, Best Online Shop and Best Crochet Store, plus choose all your favourite brands, yarns, books and designers. 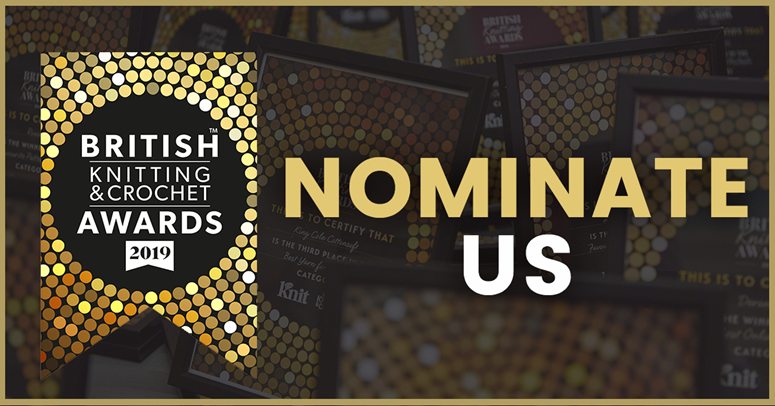 Visit the British Knitting & Crochet Awards website to nominate Craft Arena. Nominations close on 11th April. 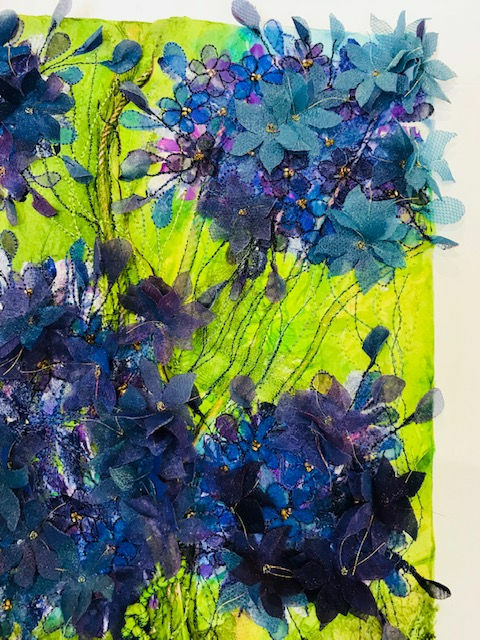 I've realised that the More Mixed Media Mayhem class I had booked for Saturday 20th April is Easter Saturday, so have rescheduled it for Saturday 11th May. More details below. I've been waiting for this book to be reprinted and it arrived this week. It is always popular, and half the stock I ordered has already gone! 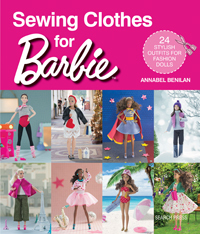 Sew Barbie this wardrobe of 24 stylish outfits. There are clothes for every day, or create outfits for special occasions, such as a floral cocktail dress or A-line wedding dress. And why not dip into the dressing-up box with fairy, mermaid and superwoman costumes? The detailed explanations are accompanied by step-by-step diagrams and real-size patterns, which can be adapted for petite, curvy, tall or original Barbie. 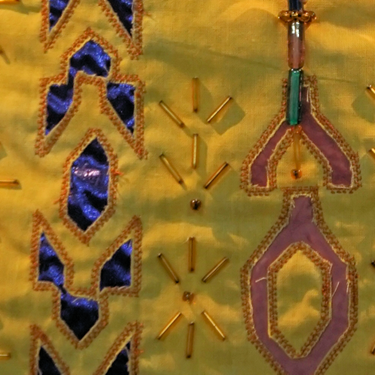 The techniques used are simple and the outfits can be sewn by hand or on the machine. These are ideal projects for upcycling old clothes or making use of scraps of fabric from your stash. Our Tantalising Textiles competition with the them Symmetry is now own. Come and vote for your favourite and you could win a Craft Arena gift voucher. The winning entry will also win a voucher and we will again be supporting St Luke's Hospice who will receive a proportion of the money raised by the fees. You can read more about the competition on our blog. Join us on Friday 31st May for our first Babylock Open Day. We will be demonstrating a range of Babylock overlock, coverstitch and speciality machines and putting them through their paces. You can just drop in on the day, or if you would like a personal demonstration, ring us on 01268 523780 to book a time. Wendy did contact me last week to change the date of this workshop and I forgot to put it in the newsletter! So I'm featuring it again this week to try to avoid any confusion! 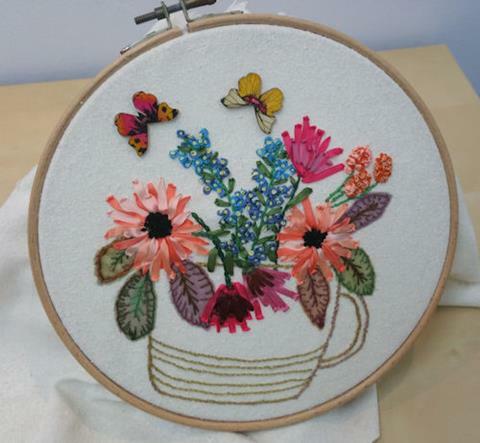 You will be able to stitch this or one of Wendy's other stunning designs on this all day workshop and will also have the opportunity to purchase the new book, Seasons in Ribbon Embroidery book with 25% discount. Join Wendy to learn the basic stitches for silk ribbon embroidery, or if you are more experienced, come along to expand your skills. You can book your place here. Alex is back in May for a two day workshop featuring beautiful floral textures. You will use a series of techniques with different materials brought together with free motion embroidery. On the first day you will work with your design and cover illustration, composition and painting techniques to create your background with different media, then you will stitch your design and create 3D elements, ie flower heads and leaves, to add to your design using water soluble fabric. You do need some experience in free motion embroidery and be happy to pick up a brush and experiment. You can find out more and book your place here. 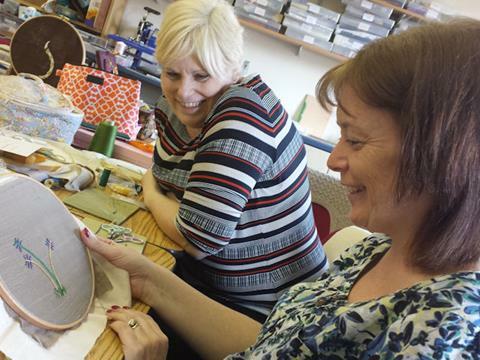 If you would like to attend the course but have not attempted free motion embroidery before, Denise can give you a starter lesson - just ring on 01268 523780 for more information. Alex's next class is Minature Books which you can book here. 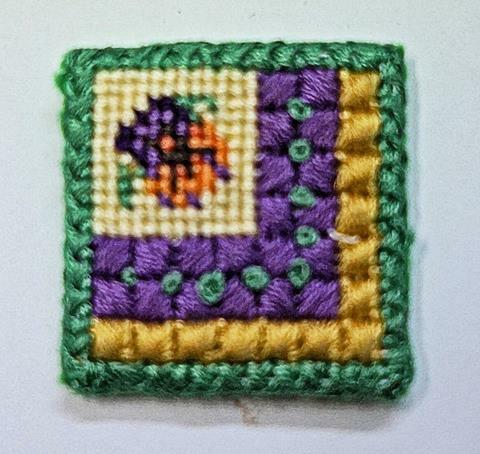 Learn the basic stitches used in canvaswork with Marion and stitch this pretty little design which can be made into a brooch or embellishment. This is a popular series of informal monthly sessions to help you get the most from your embroidery machine. 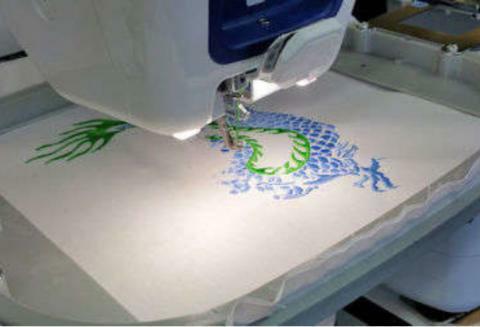 We cover a different machine embroidery technique each month and this time we ask you to bring along any challenges you have been having for a Show and Tell problem solving session. Block printing and Embroidery combined! 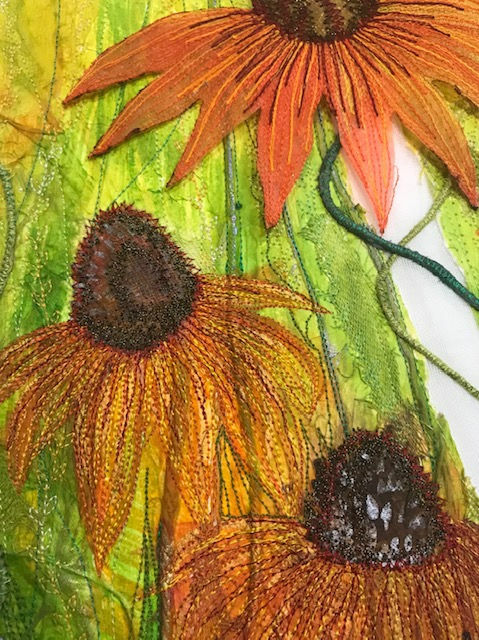 Over this two day workshop, you will be learning how to print onto a prepared background and then on the second day translate your design into stitch, learning the stitches as you go. 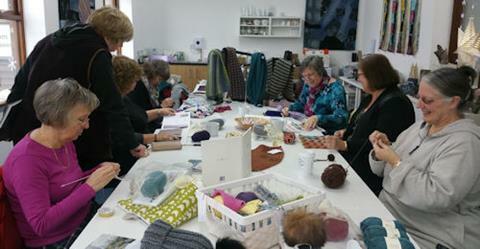 This class is suitable for the complete beginner as well as those who would like to try something a little different. Our regular Yarn Forward knitting and crochet group. 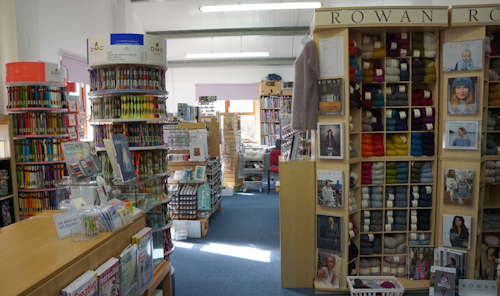 This month we welcome Addy from Rowan who will showcasing some of Rowan's wonderful yarn. ONE PLACE IS AVAILABLE ON THIS SESSION. PLEASE PHONE 01268 523780 TO BOOK. 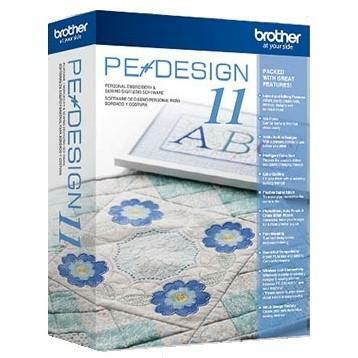 This class is for those who know the basics of PE Design software for Brother Embroidery machines. Lisa will be showing your how to add wording and pictures to your design. 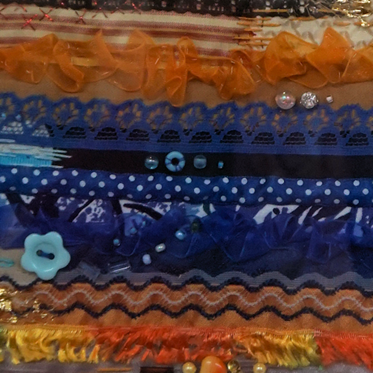 Create more Mixed Media Mayhem with Denise! Explore more ways of creating backgrounds in the morning and develop them into resolved pieces in the afternoon. We may even get around to adding stitch! This workshop is also suitable for those who have not attended our Mayhem sessions before. Join our new stitching group where you can stitch, chat and get a bit of advice if you need it! You will receive a gift worth at least £5 when you attend. All forms of hand embroidery are welcome. 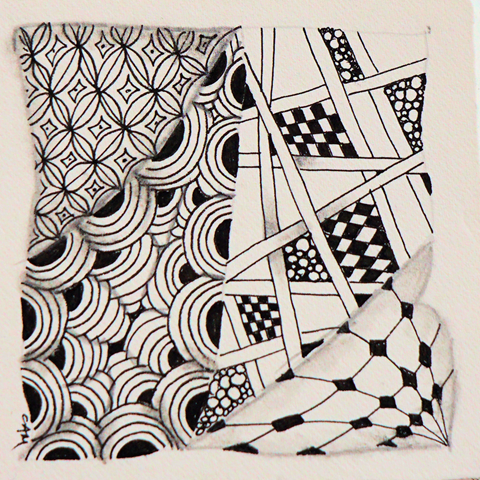 Booking is now available for Caroline McNamara's Zentangle workshop. We will be introducing you to the technique in the morning session and taking your skills further in the afternoon. Join Caroline to learn the fascinating art of Zentangle. 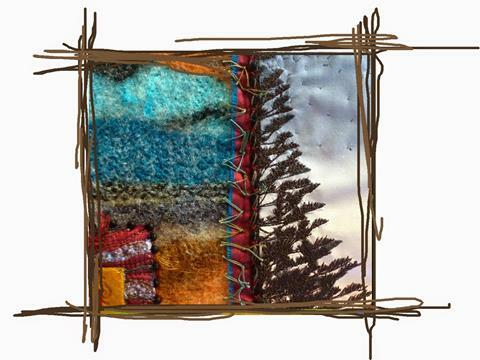 Your designs will be perfect for translating into hand or machine stitch and mixed media work. This is a two-day course with Alex Waylett, when she will show you how to construct a 3D Floral Triptych. Designed to take you through a series of innovative techniques using a multitude of different materials all brought together with free motion embroidery, the course covers illustration, composition, and painting techniques with inks from your chosen design source on the first day followed by working with water soluble and cords to create 3-d elements on the second. 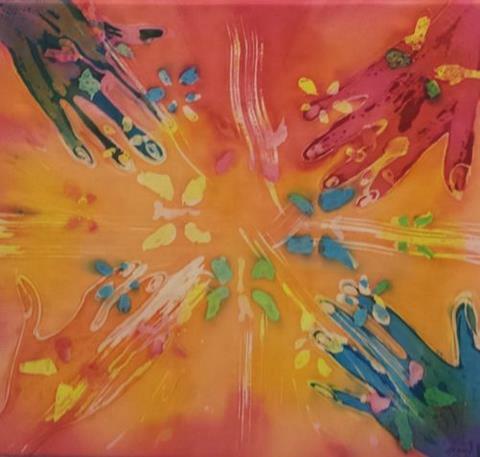 Join Jannetta for this batik workshop. 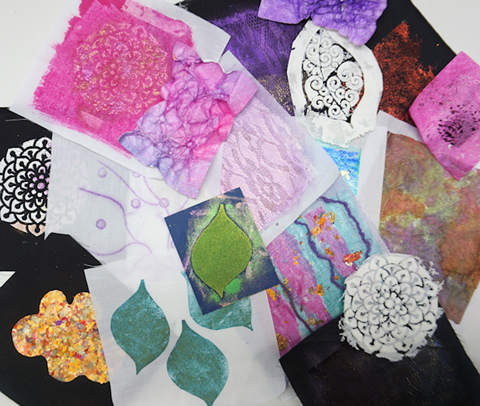 Using wax as a resist, you will draw a design and paint with silk dyes. This is a great design project that produces a number of different designs within a whole piece…almost effortlessly! The day will be spent looking at your design source in some detail and incorporates a number of colour media to achieve some great effects. Booking is now available. 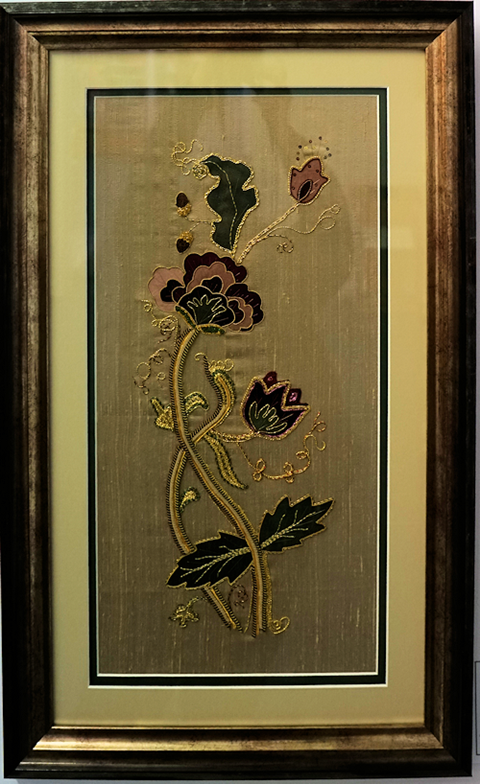 Join Wendy on this workshop to make this beautiful Jacobean Goldwork picture. Over two sessions you will learn all the stitches necessary to complete the design. Suitable for beginners and those that wish to refresh their skills as well as those who are more experienced. The illustration shown here doesn't do this work justice. Visit the studio to see it in real life! 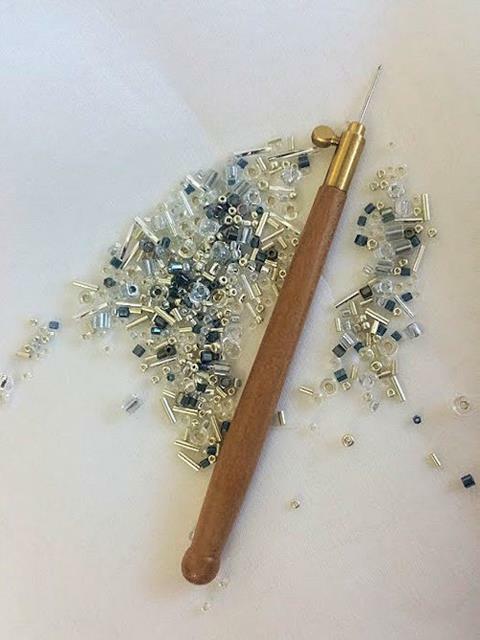 This will be a taster session where you will be able to give tambour beading a try to see how you get on with this delicate technique. You will also be able to look through samples of Angela's work to see what can be achieved once you have a little experience. 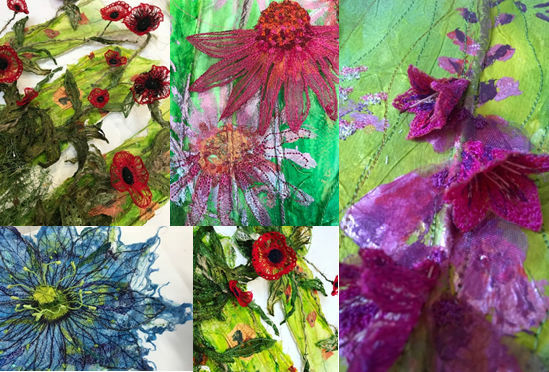 We are very excited to host a workshop by Alysn, one of my favourite Textile Artists, on her 2019 workshop programme in the UK. We are currently taking a deposit to reserve your place and more details will follow. THIS WORKSHOP IS NOW FULL. PLEASE PHONE 01268 523780 TO GO ON OUR WAITING LIST. 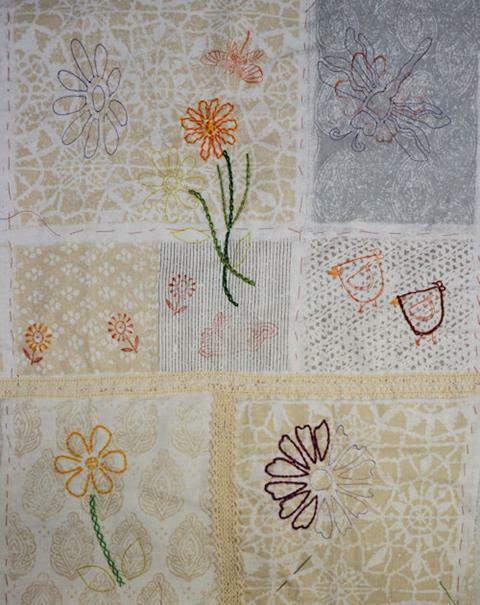 Tantalising Textiles is our annual competition which this year has the theme 'Symmetry'. You can vote for your favourite and the winner will receive a Craft Arena gift voucher, with a draw being made amongst those who vote. We are also raising money for St. Luke's Hospice, Basildon. The exhibition continues until Sunday 28th April. The new Brother promotions are now available and include the Innov-is 27SE which is £349 with Free Creative Quilt Kit worth £149.99. The Innov-is 27SE is fantastically versatile, fabulously intuitive and easy to use. 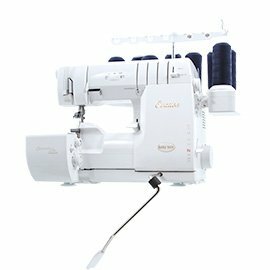 From mending and tailoring, to more ambitious fashion and homeware design, the Innov-is 27SE includes plenty of functions to allow hobbyists to grow their repertoire of skills without outgrowing their machine. You can find more promotions on our Brother blog page where we also have information on ex demonstration models available while stocks last. Ring me on 01268 523780 if you would like any more information. Don't forget you get a full introduction to help you choose the right machine for you plus free training with all machines over £200. Contact us to book a demonstration or for more information. Craft Arena are also specialist dealers for baby lock embellishers and cover stitch machines. If you would like to find out more, please ring 01268 523780 or email us. We are holding a baby lock Open Day on Friday 31st May. Look out for more details soon.